I’ve written a thing in D3.js to draw charts that show when books in a series are set, compared with the dates on which they were published. You can see three examples on bl.ocks.org. A while back I read C. P. Snow’s eleven-book Strangers and Brothers series, narrated by one man during his life in the twentieth century. The books are vague about exactly when they’re set so it’s sometimes hard to know how much time has passed between books. Also, the books’ narrative order differs from the order in which they were published. For example, the first book in the narrative, about the narrator’s childhood, was the third to be published. The version on bl.ocks.org is clearer, with added tooltips. It’s interesting to see how varied the lengths of the books are, in terms of years covered, and which books overlap each other. One of the odd things about the story is how self-enclosed each book is. For example, The New Men and Homecomings run concurrently but, if memory serves, neither refer to the events in the other in any particular detail. 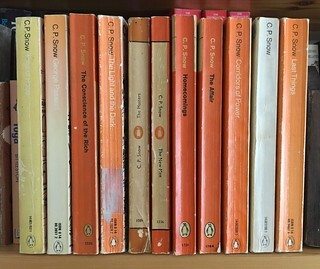 We can also see when the publishing order differs from the narrative order — Snow obviously felt a need to go back and fill in some earlier gaps with The Conscience of the Rich , the third in the narrative but the seventh to be published. This chart too is better at the same page on bl.ocks.org. We can see that here the books were published in the same order as the narrative. And that there are big gaps in the narrative of about a decade either side of the penultimate book. Maybe there’s less to write about as characters, or this character, anyway, gets older. We also see, as with Snow’s series, that the gap between narrative time and year of publishing gets narrower towards the end. This is also on that bl.ocks.org page. Obviously there’s a greater distance between narrative time and year of publishing, particularly early on, which is unsurprising given the 178-year time span. It’s mostly pretty straightforward, with the major oddity being that the first book published, Washington, D.C. is the penultimate book in the narrative. I don’t know whether I’d have come up with the same design before or not, but the horizontal bars are very similar to those on the MoMA Exhibition Spelunker I made with Good, Form & Spectacle such as the Departments graphic. 6:37pm: @dracos Thanks, but I’m pretty sure I’d never been to Peckham back then. 6:32pm: @suegyford If only I had that data! I was so slapdash in my younger days. 6:31pm: Another quiz! Anyone know where a Spotlight record shop is/was? Probably somewhere in London or Bristol. 6:24pm: @megpickard @zzgavin The one on the left is quite like some I have which are Fopp, because the say so on the (larger) label. Not sure if this is the same though. 6:21pm: @DeanVipond Oh yes, I should have spotted that! Good work! 6:10pm: @dwlt Ah, good thinking, ta. I can’t remember the last time I went into a Fopp! 6:03pm: Does anyone recognise these labels on CDs? Which shop they’re from? Fopp? HMV? Somewhere else? 9:57am: @antimega @ukglo I miss the Simply Sausages shop.